KEYWORDS: Daina, Taimina, Hyperbolic Planes, Crochet, Latvian Mathematician. Taimina’s most famous and, admittedly, greatest achievement has been her innovative approach to teaching geometry using crocheted hyperbolic planes1(46). Dissatisfied with the quality of paper hyperbolic surfaces used during a workshop she was attending due to their fragility, Taimina convinced herself that a better and more durable alternative exists2(13). Inspired by Confucious’ ”what I hear I forget, what I see I remember, what I touch I understand ” dictum3(1), she realised these thoughts during the workshop itself and constructed her first small crocheted hyperbolic plane while more followed later3(13). This has been a major breakthrough4(18) as the idea of hyperbolic planes only appeared in the 1829 and 1832 by Nicholas Lobachevsky and János Bolyai respectively but without any success in creating a physical, usable structure to resemble a non-Euclidian surface. Therefore, Taimina’s feat has filled a significant gap in the world of geometry as students are now able to ”touch and feel a surface that was previously understood only in an abstract way”5(278). Recalling a conversation with one of her colleagues who was an expert in hyperbolic planes, she describes his excitement when he faced for the very first time something that until that moment existed only in ”his imagination”5(278). As David Henderson explains in light of Taimina’ s innovative creations, physically experiencing straight lines and realising how they behave and intersect when they are folded is essential in acquiring a quick and concrete understanding of the ”intrinsic properties of hyperbolic geometry”6. The success of Taimina’s crocheted hyperbolic planes and their influence on the science of mathematics is also evident through the numerous orders she has received to provide mathematics departments around the world with her highly sought constructions6. In addition to her hyperbolic planes, she published two books. ”Crocheting Adventures with Hyperbolic Planes” is a personal approach by Taimina to her invention in which she describes her inspiration behind her crocheted structures, their importance as well as the complex science behind them3. Likewise, ” Experiencing Geometry”, provides a thorough historical review of the evolution of mathematics ideas and geometry in particular7. Daina Taimina was born in Riga, Soviet Latvia, on the 19th of August 1954. As the Soviet educational system highly favoured and encouraged women in science8, Taimina received all her tertiary education in Latvia. She graduated in mathematics education and mathematics from the University of Latvia and subsequently completed her PhD in Theoretical Computer Science at the same university under the supervision of the computer scientist, Rusins Freivalds. In 1977, she started lecturing at the University of Latvia and she did so for the next twenty years. During her career at the University of Latvia, she developed an interest in the history of mathematics9(177) and took the initiative to introduce such a course in the curriculum of mathematics education10(103). This led to the publication of her first book on the history of mathematics; the first of its kind to be written in the Latvian language10(104). Her deep interest in geometry also led to her participation in the ICIM Study conference on the teaching of geometry11(xv) which took place in Sicily in 1995 and it is where she met her future husband and scientific collaborator, David Henderson11(xv). In 1997, she became a visiting associate professor at Cornell University. Her Latvian upbringing has been a major influence in her creations due to the country’s rich tradition in handicrafts12. It is her gender, however, that seems to have been the main contributor to her scientific success since she managed to turn a hobby intrinsically associated with women into an outstanding work of science. As Bellos puts it, the idea of crocheted hyperbolic planes would have never been conceived had Daina been born a man5(279). Taimina is, therefore, the perfect example of the value of female contribution to science as her invention has also created a major impact on the cultural history of mathematics; a field where women have been historically underrepresented5(279). Daina Taimina currently resides in the United States with her husband, David Henderson, and their children and holds the position of senior research associate at Cornell University. David Henderson, apart from her partner in life, has been Taimina’s main collaborator. Together they co-authored the book ”Experiencing Geometry” as well as a journal detailing the process of constructing crocheted hyperbolic planes2. Moreover, they have lectured together in Los Angeles upon the invitation of The Institute for Figuring3(6) and at Cornwell University in New York among other occasions. Also, as colleagues at the same University, they co-operated in delivering classes and workshops2. Taimina’s scientific innovation was widely acclaimed by the academic and the scientific community. Alex Bellos, claims that Taimina’s crocheted models have offered a ” visceral experience of the hyperbolic plane” and an ”important new insight into a conceptually punishing area of math”5(278). The New York Times in an article titled ” Professor let her fingers do the talking ” praised Taimina’s innovative idea to turn her talent in crocheting into an advanced method teaching geometry13 while Discovery magazine exalted her achievement in materialising a concept that was deemed to be unimaginable14. ”Crocheting Adventures with Hyperbolic Planes” (2009), Natick, Massachusetts, A.K Peters. Samuels, David ( 6 Mar.2006), Knit Theory, Discover, http://discovermagazine.com/2006/mar/knit-theory (last accessed 29. May 2017). 2010: Diagram Award for the oddest title book title for ” Crocheting adventures with hyperbolic planes” . 2012: Awarded the Euler Book Prize by the Mathematical association of America for ” Crocheting adventures with hyperbolic planes”. The works of Daina Taimina have exceeded the limits of science. 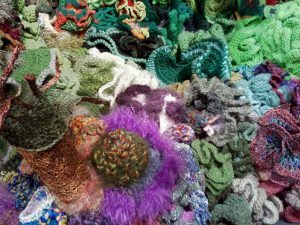 Her crocheted models are now considered a work of art12 and have been showcased in arts exhibitions in many parts of the world such as USA, Italy, UK and Belgium15. She has also carried out workshops on the art of crocheting to prospective artists encouraging students to break into three dimensional crochet design12. Another indication of Taimina’s success in bridging mathematics with the arts was the invitation she received to deliver a speech at the Mathematics and Mathematics Education in Fibre Arts session in Atlanta in 2005. Also, using one of her most famous artistic creations, ” The White Could of Thoughts”, as linkage to her political views of today’s Europe, she published an article in the Guardian in the days leading to the Brexit referendum with the title : ” Together the EU is greater than the sum of its parts”16. She strongly supported the remain side claiming that, just as the pieces of her installation are creating something greater when combined, a country is stronger and more prosperous when part of a community, in this case the European Union16. Inspired by Daina Taimina’s innovative crocheted models who is credited for spawning ”a global movement of crochet activism”5(279). 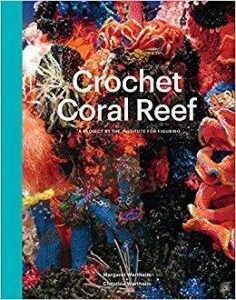 Wertheim Margaret / Wertheim Christine (curators) (2010-2011), The Crochet Coral Reef, Smithsonian’s National Museum of Natural History, Washington, Washington D.C.
Wertheim Margaret / Wertheim Christine (2015), Crochet Coral Reef: A Project, Los Angeles, California, Institute for Figuring. Henderson, David / Taimina, Daina (2001), ”Crocheting the Hyperbolic Plane”, Mathematical Intelligencer,23(2), 13-28. Taimina, Daina (2009), Crocheting Adventures with Hyperbolic Planes, Natick, Massachusetts, A.K Peters. Henderson, David/ Taimina, Daina (2010), Experiencing Geometry: Euclidean and non-Euclidean with History, 3rd Edition, Upper Saddle River, New Jersey, Prentice Hall. O’Reilly, Arwen (2006), ”Crafting Geometry”, in Craft: Transforming Traditional Crafts, vol.1, Sebastopol, California, O’Reilly Media Inc, 46-48. Buszek, Maria Elena (2011), Extra/Ordinary: Craft and Contemporary Art, Durham, North Carolina, Duke University Press. Bellos, Alex (2010), Here’s Looking at Euclid: A Surprising Excursion Through the Astonishing World of Math, New York City, New York, Free Press. Mandel, William (1971), ”Soviet Women in the Work Force and Professions”, American Behavioral Scientist, 15(2), 255-280. Gellasch, Amy Shell (2007), Hands on History: A Resource for Teaching Mathematics, Washington D.C, Washington, Mathematical Association of America. Fauvel, John/ Maanen, J.A, History in Mathematics Education: The ICMI Study, Dordrecht, Kluwer Academic Publishers. Sinclair, Nathalie/ Higginson, William (2006) , Mathematics and the Aesthetic: New Approaches to an Ancient Affinity, Berlin, Springer. York, Michelle (11 Jul. 2005), ”Professor Lets Her Fingers Do the Talking”, The New York Times, <http://www.nytimes.com/2005/07/11/nyregion/professor-lets-her-fingers-do-the-talking.html?_r=0 > (last accessed 23 May 2017). Samuels, David (6 Mar. 2006), Knit Theory, Discover Magazine, <http://discovermagazine.com/2006/mar/knit-theory>, (last accessed 29 May 2017). Taimina, Daina (27 Nov. 2016), ”From Mathematics to Art”, Sinkka, <http://www.sinkka.fi/tapahtumat/lectureworkshop-daina-taimina-from-mathematics-to-art/> ( last accessed 14 May 2017). Taimina, Daina ( 24 May 2016), ”Together the EU is greater than the sum of its parts”, The Guardian, <https://www.theguardian.com/commentisfree/2016/may/24/together-eu-greater-sum-parts-latvia>, (last accessed 28 Apr. 2017).